I’m just barely here. Elated to finally move and now exhausted with the effort; made a bit more difficult by all of these wood floors. Oh I love them and I’ve promised myself I’m not going to treat them like precious china but still; moving furniture is more difficult and I’m sort of a try it here, no wait, try it there type before I get the look I want. I decided to take a break from it today until I can get some pads to make moving easier; boy could I use a couple of those young guys that were here last week! I am not deep in the heart of rural Colorado but I have moved further south of Denver to a town called Castle Rock, CO and I’ll want to coordinate my errands a bit more than I used to. Running to the store used to mean 5 minutes and now it’s 15; seems minor but in the long run, at least for me, I’ll be planning better and making less of those quick trips. Yesterday I carefully made a list of the things I needed from a couple of different places; I neatly typed it up and printed it out and then I did what I worried about doing when I networked my laptop to a printer in a different room…I forgot the list! I knew I needed Bisquick and butter from Costco but without my list I went awry and came out $200 later (and yes, forgot a couple of things!). Ah well, better to be well stocked during this cold anyhow, right? I had so many little things I wanted from Home Depot Lowe’s (daughter just started working there as a Logistics Analyst; better change my allegiance) so I’ve decided I’ll go back later this week with that list; I know without it that I would have forgotten half of what I wanted! Bed, Bath and Beyond was on my route with one item but I also bought some inexpensive measuring cups. I have two nice pairs of stainless ones…somewhere. Speaking of somewhere. The one box I couldn’t find? The one I took with me for my transitional stay; more important than clothes or hair dryer or makeup? 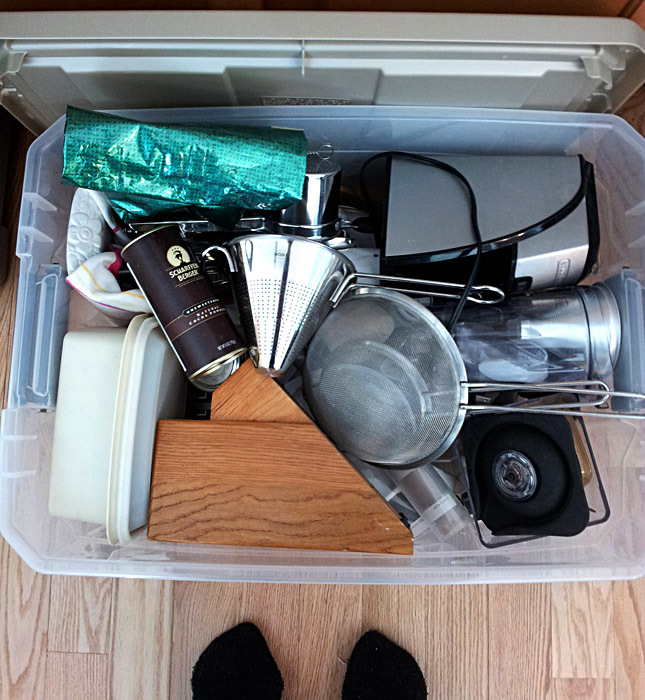 It’s where I stored my Blendtec, my good knives, my Cuisinart blades, my immersion blender, my coffee grinder and well, everything I thought I couldn’t live without. I brought it here myself and I had looked EVERYWHERE imaginable or at least imaginable for where I thought I might have put it. It’s not a little box and I thought I had done a thorough job but with so many boxes piled on top of each other I kept hoping it would show. I tried to stay calm but this morning I started to lose it. Whole coffee beans were not going to work and I needed coffee. I got desperate. As in walking to the basement for the first time. There was my Christmas!! And no, I don’t mean just my Christmas stuff but my box. My treasures. Guess a mover thought he was helping. I don’t care now that it’s found; I’m just happy, happy, happy! I love my new kitchen; it’s compact but has more cabinet and counter space and WAY more natural light than the one I left. I can actually reach those upper shelves in the cabinets too! Well, I can reach them well enough to push something on them; a stool is going to be required to get something down; I’m 6′ tall too; so I’m guessing a lot of people have to use a stool to use tall cabinet space, right? I’m really enjoying my new stove; I haven’t had a gas range in years and so far so good. It’s a freestanding range that’s a double oven and it’s working well for me. The top unit is the smaller of the two and I use it for things I used to use a counter-top oven for so I can relegate that unit to Goodwill and free up some counter space. That door to a pantry; it’s like my own personal secret garden; AMAZING how much I have in there. Now if I can just get my pot rack installed I’ll be a truly and totally happy camper! I’ll do a post with more photos later; I still have so much work to complete before the place is photo ready but like any cookaholic; the kitchen had to come first, right? Meals so far have been eggs with hash brown potatoes and a big pot of soup so I wasn’t entirely surprised by my Costco bill. I had all my food with me during my time out of the house but I also used a lot of it; things needed to be refurbished and butter had to be bought…a whole lot of butter when you’re Costco shopping! I’ve been craving more vegetables and salads. Living in the home with a male presence saw us eat less of those and more meat. Too much meat for me! I love it but it’s not an every night thing; I can eat a big bowl of veggies and be happy as a clam and that’s what I did last night and this recipe was perfect. When I was asked to review ‘The Fresh Honey Cookbook‘ it was a book that sounded right up my alley. I LOVE honey; I use it in a lot of recipes from barbecue sauce to dressings to shakes to cakes and cookies and like Laurie have long used it to make sweet tea in the summer. All of the recipes are inspired by honey bees, the food they pollinate, and the wonderful range of honey they produce. Highlighting a different honey varietal each month (tupelo, orange blossom, acacia, avocado, raspberry, tulip poplar, sourwood, blueberry, cranberry, eucalyptus, chestnut, and sage), beekeeper and chef Laurey Masterton offers amazing dishes made from simple, fresh ingredients. I want to try so many but last night I needed it to be something relatively simple and these green beans fit the bill. The original recipe called for Haricots Verts which is basically new baby green beans; those would be nice but I used good old regular green beans and they were great too. Still, I can’t wait to try the Candy Roaster Squash Soup, Pork Tenderloin with Orange Blossom Honey-Mustard, Turkey Roulade in Puffed Pastry with Cranberry Chutney, Wild Salmon with a Smoky Onion Crust, Sweet Potato Salad with Sourwood Honey and Coconut Macaroons with Dried Cherries. The book also has some interesting honey-tasting tips and fascinating glimpses into the life of a beehive including why bees make honey, how it’s harvested and what all of us can do to help the bee population. This book shows an appreciation of both bees and the honey they produce and if this simple recipe is any indication; it’s a book I already love! Combine the vinegar, honey and mustard in a medium bowl and mix with a wire whisk. Drizzle the oil into the bowl in a thin stream, whisking constantly until well blended.Taste and correct with salt and pepper if necessary. Bring a large pot of water to a boil. Fill a large bowl with ice water. Put the green beans into the boiling water and watch carefully (regular beans may take a bit longer than these directions for haricot verts but still; watch that color for a sign they are done). When they beans turn a bright green, immediately remove them from the pot and immerse them in the cold water which will stop the cooking process and have them retain their color. Once cooled, remove them from the ice water and drain in a colander. 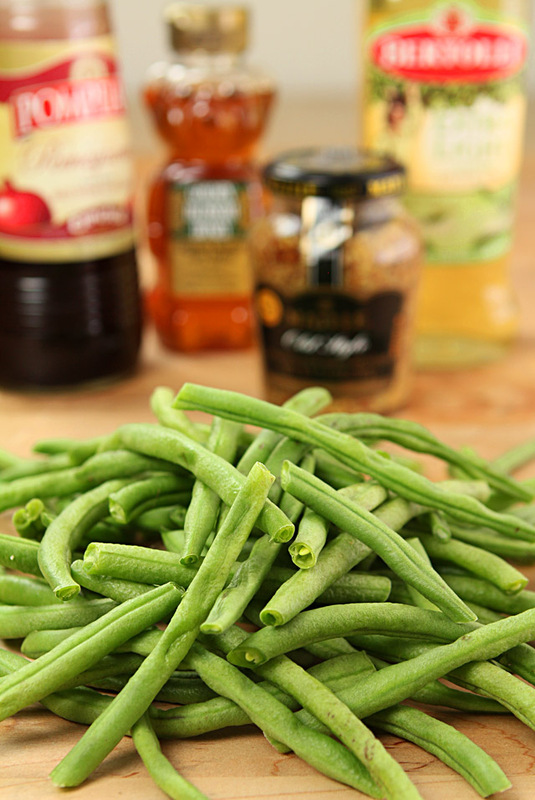 Arrange the green beans on a serving platter, drizzle them with the vinaigrette and serve. 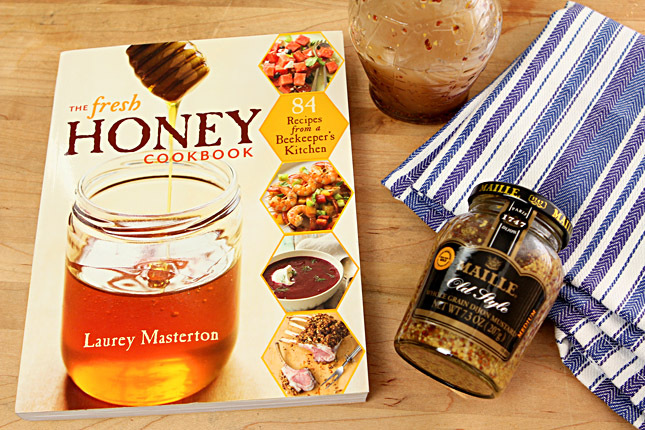 I was provided with a review copy of The Fresh Honey Cookbook however all commentary is my own. Came for the recipe, but started reading about the moving pains… A little trick I learned from my dad. Take some potatoes, cut them in half, place them under the furniture with the inside part facing down, profit ;). Basically, you can use them instead of furniture pads, all you need to do is clean up the floor after. No scratches left, though. Also, planning to try out the recipe soon! I bought some felt/cushioned things at the hardware store and they were perfect. Of course then I moved one thing ‘just a little bit’ without them and scratched the floor. I know one day I won’t even see that scratch but I’m not there yet! Thanks for the info; might be useful for others. I know…isn’t it pure simple and good? I’m with you…lots of salads will be dressed in this! I like your new kitchen! My current place has a large kitchen but it’s all floor. We’ve even resorted to plastic shelving to extend our pantry and our side-by-side refrigerator, well, whoever invented those things should have never been born! Thanks; I do love it too. I never went the side by side route and I’ve heard nothing but complaints about them. I’m so tall that the first bottom freezer/top fridge unit I think ever offered was one we bought for our first home a bazillion years ago; the idea that I wouldn’t have to stoop on an everyday basis to find things was pretty appealing and that has never changed! I’m so happy you have moved in! Your kitchen looks lovely, dying to see the pantry! $200 for bisquick and butter, glad it’s not just me that does that! Hope you have lots of happy cooking in that lovely kitchen! Nice beans, sounds like a good book. I love the sound of the salmon with the smoky onion crust! I have everything in the pantry that I used to have in both a kitchen cabinet pantry and another cabinet pantry that was in the garage. Seems I’m so spoiled that I don’t have to go out to the garage anymore when I’m cooking! I’ll take a photo soon just for you Jayne! Thanks so much Doreen; I just love it here. The lot is small and people are a lot closer and I admit that’s going to take some getting used to…but I was burned out with taking care of a huge yard and this holds promise of me having time for something else on weekends…that might be nice! I do want to get some plantings in this summer; I would rather use greenery to create some boundaries than put up fences; we’ll see what others do but that’s my plan! Happy new kitchen! How fun! Beans with honey and mustard, this is my kind of recipe! I love your kitchen AND your floors. It’s so light and airy and will be a great place to create wondrous things. 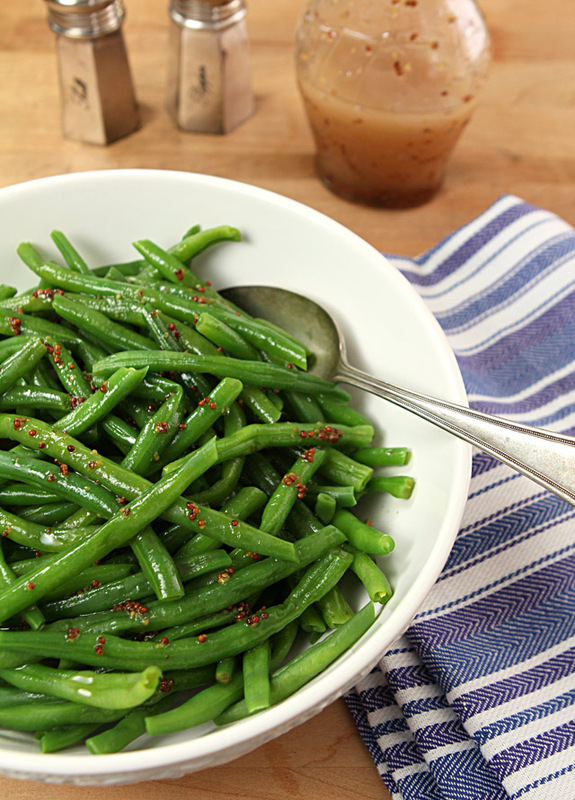 Your green beans are pretty swish! I want those too. If something isn’t on our shopping list, it just doesn’t exist! We always forget stuff that’s not on the list. We’ve got lists on our phones that work pretty well (and we share an account so as we’re shopping together, we can see what each one of us is crossing off the list). Anyway, your new house sounds great! If you have some carpet scraps, I find those useful for moving furniture around on hardwood floors – put the plush side down, and the furniture on it, and you can scoot it around on the floor without doing damage. Lovely recipe, btw. I love honey in vinaigrette. Great idea John…there was one piece I put under the engine of my oil leaking car but I’m going on a hunt now; that’s exactly what I need and I think I might have spied a piece in the basement during walkthru. Pretty much what I was going to buy so thanks for saving me a few bucks; I’m burning through the $$$ enough!! There is nothing more heavenly than Tupelo honey, honey. Now that Van Morrison song will be stuck in my head for a week or so. Anyway the house is gorgeous and kitchen looks great. These beans don’t look too shabby either. That’s so true about honey, sweetie. 🙂 It’s getting there. I want to do those pieces of furniture in the family room differently though so on the hunt for pads for the feet. It’s crazy putting that TV so far from all the wiring I guess so need to get creative with setting that chest up over by the cable and speaker outlets. Tomorrow. Tomorrow I’ll do it tomorrow. There…another song for your head! Your kitchen is so nice! I love the light and the space. Take the unpacking a little at a time and you’ll be moved in before you know it. 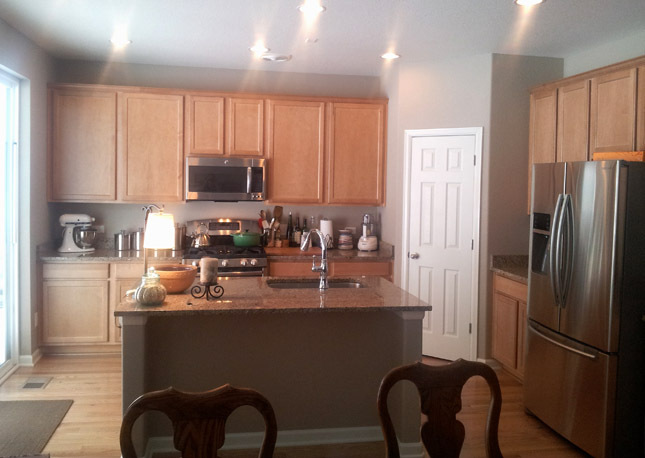 I love it; actually more counter and cabinet space than the one I left and the pantry is, well, WONDERFUL! I just cleaned up the hallway of boxes and paper; OK that’s a good goal for the day! I wish I could just do it all but I came into this exhausted and don’t think killing myself with work is the plan at the moment. 🙂 Can’t wait to have you come visit! Your new place is looking great! I’ll bet you are exhausted, but so nice you are eating healthy! I actually have some green beans in my fridge that need a home! These look great! I’m ready to eat Fries with you. Let me know when you are ready to come up for air! P.S. I like Lowe’s! Yep, we moved from a town where you could walk to everything, to the “sticks” where everything is a minimum of a 15 minute drive. It seemed so long in the beginning, but you get used to it! I can’t wait to try this – I love all things mustard! My pot rack will be up soon I hope; not only does it make getting pots handier but I need the cabinet they are taking up for other things! Picking that fridge was a challenge; so many new options…but I’m happy with it so far. Funny…far less room for condiments in the doors; and I have a LOT of condiments!